Why I dreaded the arrival of Back to the Future Part II day, since it was the only date in the future about which we were already nostalgic. October 21st, 2015 has been always been destined to disappoint. It’s one of the most eagerly anticipated dates, well, ever, since it was the date Marty McFly jumped to in Back to the Future Part II. Ever since the movie came out in 1989, people have speculated about whether the future really would look like the movie’s vision. You know the drill: Hoverboards, self-lacing Nikes, Cubs finally win World Series, flying cars, transforming newspapers, and so on. The speculation was cranked up to ubiquitous levels once the Internet listicle era hit. I jumped in on the speculation (borderline prematurely) six years ago, writing about the 11 predictions that Back to the Future Part II got right and 11 predictions that Back to the Future Part II got wrong. They were both wildly successful for me and helped elevate my website’s profile. Thousands — literally, thousands — of other websites have done similar lists. I’m not saying they ripped me off. Those are some of the most obviously guaranteed-to-be-popular topics for lists you could ever write. But as the date has gotten closer and closer, I haven’t found myself looking forward to it — the opposite, in fact. I didn’t want October 21, 2015 to arrive. And yesterday, the reason it finally hit me: The Back to the Future Part II version of October 21, 2015 is unique in being the only date in the future about which we’re nostalgic. No other science fiction vision of the future can make that claim. This is it. And now that it’s here, reality can’t compare. Real October 21, 2015 never had a chance. We have plenty of cool stuff, even if most of it doesn’t match the movie. We don’t have hoverboards but we have the Internet. We have our incredible phones. We’re less than 30 seconds away from listening to any song, watching any movie or TV show, having someone pick us up and drive us anywhere we want for like $5 or seeing real-time pictures of what our friends are doing. Beyond technology, we live longer than ever. AIDS isn’t a death sentence anymore. A generation of kids is growing up with tolerance being the norm. There’s a new wacky flavor of Oreos every week. And yeah, there are plenty of flaws (worst political climate in 150 years, we’ve destroyed the climate, the fact that “Instagram models” are a thing) — but real 2015 is pretty cool. Fake 2015 is cooler. 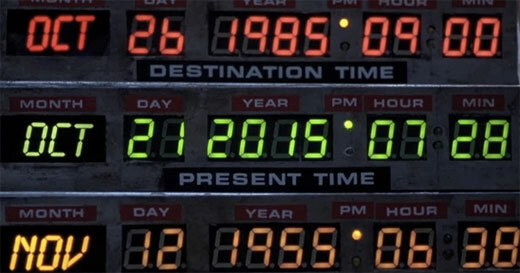 Because the October 21, 2015 of BTTF2 was never the future — it was always the past. And the present and the future can never compete with the past. Trying to defeat nostalgia is Sisyphisian at best, impossible at worst, and today is the only day in history that suffers from those impossible standards. It cut even deeper than that, too. Today isn’t just the present of the future as it was romanticized in the past — when we wake up tomorrow, our nostalgic future is part of the past. Today has been a landmark day, circled on the calendar, for more than 25 years. And now it’s over. We don’t have another shared vision of the future coming up, not one like this. So now what becomes of the October 21, 2015 of Back to the Future Part II? Over time, probably the same fate as 1984 in 1985. Still holds its place as a classic but becomes a lesson of what people in the past believed about the future, not what WE in the present did. Beyond that, the Back to the Future series takes on a whole new meaning now. Its ultimate lesson was not to dwell on or live in the past and always look to the future — but it made us dwell on a future that’s now, finally, the past. Future generations who see the series for the first time won’t understand, but we always will. Perhaps one day the hoverboards and dehydrated food and double necktie look will arrive and we’ll lovingly connect them to BTTF2. Nostalgia is good like that, especially now that we can transition it from its unique place in the future to its standard place in the past. And we do it tomorrow, as we move on to the real future, one without the shared pre-nostalgia of October 21, 2015. I’m really going to miss that.